A long-standing paradox in cellular immunology has been the conditional requirement for CD4+ Th cells in priming of CD8+ CTL responses. 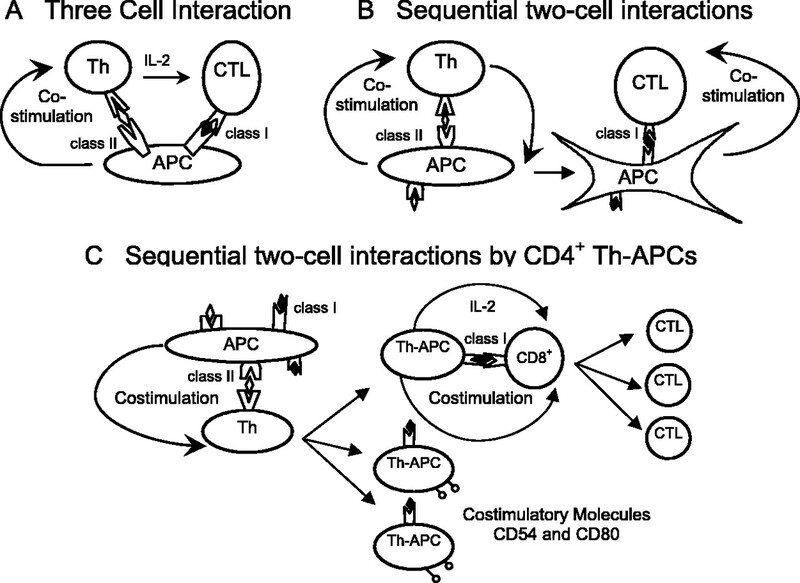 We propose a new dynamic model of CD4+ Th cells in priming of Th-dependent CD8+ CTL responses. We demonstrate that OT II CD4+ T cells activated by OVA-pulsed dendritic cells (DCOVA) are Th1 phenotype. They acquire the immune synapse-composed MHC II/OVAII peptide complexes and costimulatory molecules (CD54 and CD80) as well as the bystander MHC class I/OVAI peptide complexes from the DCOVA by DCOVA stimulation and thus also the potential to act themselves as APCs. These CD4+ Th-APCs stimulate naive OT I CD8+ T cell proliferation through signal 1 (MHC I/OVAI/TCR) and signal 2 (e.g., CD54/LFA-1 and CD80/CD28) interactions and IL-2 help. In vivo, they stimulate CD8+ T cell proliferation and differentiation into CTLs and induce effective OVA-specific antitumor immunity. Taken together, this study demonstrates that CD4+ Th cells carrying acquired DC Ag-presenting machinery can, by themselves, efficiently stimulate CTL responses. These results have substantial implications for research in antitumor and other aspects of immunity. Generation of effective CTL responses to minor histocompatibility or tumor Ags not associated with danger signals often requires help from CD4+ Th cells via cross-priming (1). Such help was originally thought to be mediated by CD4+ T cell IL-2 acting at short range to promote CD8+ T cell proliferation (2). Two models of CD4+ T help for CD8+ CTL responses have been proposed previously, including the passive model of three-cell interaction (3, 4) and the dynamic model of sequential two-cell interactions by APCs (5). The three-cell model suggested that activated CD4+ T cells and naive CD8+ T cells must interact simultaneously with a common APC and that the CD4+ Th cells provide CD8+ T cell help via expression of IL-2 (Fig. 1⇓A). The conundrum, however, is how a rare Ag-specific CD4+ Th cell and an equally rare Ag-specific CD8+ T cell (typically 1 in 105–106 T cells) would simultaneously find the same Ag peptide-carrying APC in an unprimed animal (6). Instead, Ridge et al. (5) have proposed a dynamic model of two sequential interactions, in which an APC first offers costimulatory signals to a CD4+ Th cell and then to a CD8+ CTL cell (Fig. 1⇓B). According to this model, the APC-stimulated CD4+ Th cells must first reciprocally counterstimulate the APCs (through CD40 (CD40L)3 signaling) such that this newly “conditioned” APC can then directly costimulate CD8+ CTLs. Support for this model comprises evidence that Ag-specific CTL responses can be induced by vaccination with either large numbers of APCs activated in vitro through CD40 signaling or, in either MHC class II knockout (KO) or CD4+ T cell-depleted mice, by high level activation of APCs in vivo with anti-CD40 Ab (5, 7, 8, 9). Although this model provides a possible explanation for the conditional nature of T cell help for CTL responses, the experimental conditions used in the above studies may well not accurately model the physiology of Th cell-dependent immune responses in vivo. In addition, a scarcity caveat remains (10), in that very small numbers of Ag-bearing APCs (11) must first activate and be conditioned by the rare naive Ag-specific CD4+ Th cells, and then find and activate in turn equally rare naive Ag-specific CD8+ CTLs. In addition, this model does not explain how Th cells’ IL-2 would be precisely targeted to Ag-specific CD8+ Ag-specific CTLs. Furthermore, the life span of an activated dendritic cell (DC) in the T cell zone of a lymph node is ∼48 h (11, 12, 13), possibly due to CD4+ T cell killing of the cognate APCs (14, 15), whereas the Ag-specific CTL response is first detected at about day 5 in the lymph nodes (11, 16). Thus, this dynamic model also does not explain compellingly the temporal gap between Ag presentation and the acquisition of CTL effector function in vivo. Three models for the delivery of CD4+ Th to CD8+ CTL. A, The “passive,” three-cell interaction model, in which APCs simultaneously present Ag to the Th and the CTL, but deliver costimulatory signals only to the helper. The CD4+ Th cell in turn produces IL-2, which is required for CTL activation. B, The dynamic model of sequential two-cell interactions by APCs, in which the APC offers costimulatory signals to the CD4+ Th, which reciprocally “licenses” the APC (left side) such that it can only then directly costimulate the CTL (right side). C, The new dynamic model of sequential two-cell interactions, in which APCs license CD4+ Th cells to act as APCs (Th-APCs). APCs directly transfer MHC class I-Ag complexes and costimulatory molecules to expanding populations of IL-2-producing Th cells, which thereby act directly as Th1-APCs to simulate CTL activation. It is recognized that stimulation of T cells by APCs involves at least two signaling events: one elicited by TCR recognition of peptide-MHC complexes and the other by costimulatory molecule signaling (e.g., T cell CD28/APC CD80) (17). A consequence of such Ag-specific T cell-APC interactions is the formation of an immunological synapse, comprising a central cluster of TCR-MHC-peptide complexes and CD28-CD80 interactions surrounded by rings of engaged accessory molecules (e.g., complexed LFA-1-CD54) (18, 19). One important feature of synapse physiology is that APC-derived surface molecules are transferred to the Th cells during the course of their TCR internalization followed by recycling (20, 21). In theory, if tumor peptide-presenting DCs do transfer a complete set of Ag-presenting molecules (e.g., MHC peptides, CD54, CD80) to IL-2-expressing CD4+ Th cells, then these recipient T cells might also have full capacity to in turn present these tumor epitopes to CD8+ T cells and thereby initiate productive antitumor CTL responses (Fig. 1⇑C). In this study, we examined membrane molecule transfer from APCs to CD4+ T cells by APC stimulation. We found that CD4+ T cells cannot only acquire the synapse-composed MHC class II and costimulatory molecules (CD54 and CD80), but also the bystander MHC class I-peptide complexes from APCs and these acquired molecules on CD4+ T cells are functional. The CD4+ T cells carrying acquired APC Ag-presenting machinery can thus act as CD4+ Th-APCs in stimulation of CTL responses in vitro and in vivo. The highly lung metastatic B16 mouse melanoma BL6-10 and OVA-transfected BL6-10 (BL6-10OVA) cell lines were generated in our own laboratory (22). Both cell lines form numerous lung metastasis after i.v. tumor cell (0.5 × 106 cells/mouse) injection. The mouse B cell hybridoma cell line LB27 expressing both H-2Kb and Iab, the mouse thymoma cell line EL4 of C57BL/6 mice, and the OVA-transfected EL4 (EG7) cell line, which is sensitive to CTL killing, were obtained from American Type Culture Collection. Both BL6-10 and BL6-10OVA express similar level of H-2Kb, but not Iab (data not shown). Both BL6-10OVA and EG7 cells expressed OVA by flow cytometric analysis, whereas BL6-10 and EL4 cells did not (Fig. 2⇓). T cell hybridoma cell line RF3370 expresses TCR specific for H-2Kb-OVA peptide complexes (23). The biotin-labeled mAbs specific for H-2Kb (AF6-88.5), Iab (AF6-120.1), CD3 (145-2C11), CD4 (GK1.5), CD8 (53-6.7), CD11b (MAC-1), CD11c (HL3), CD25 (7D4), CD54 (3E2), CD69 (H1.2F3), CD80 (16-10A1), and Vα2Vβ5+ TCR (MR9-4) were obtained from BD Pharmingen. The OVAI (SIINFEKL) and OVAII (ISQAVHAAHAEINEAGR) peptides (24, 25) are OVA tumor peptides for H-2Kb and Iab, respectively, whereas Mut1 (FEQNTAQP) peptide is an irrelevant 3LL lung carcinoma for H-2Kb (26). These peptides were synthesized by Multiple Peptide Systems. The OVA-specific TCR transgenic OT I and OT II mice and H-2Kb, Iab, CD4, CD8, CD54, and CD80 KO mice on a C57BL/6 background were obtained from The Jackson Laboratory. Homozygous OT II/H-2Kb−/−, OT II/Iab−/−, OT II/CD54−/−, and OT II/CD80−/− mice were generated by backcrossing the designated gene KO mice (H-2Kb) onto the OT II background for three generations; homozygosity was confirmed by PCR according to The Jackson Laboratory’s protocols. All mice were maintained in the animal facility at the Saskatoon Cancer Center and treated according to animal care committee guidelines of the University of Saskatchewan. Flow cytometric analysis of OVA expression by flow cytometry. 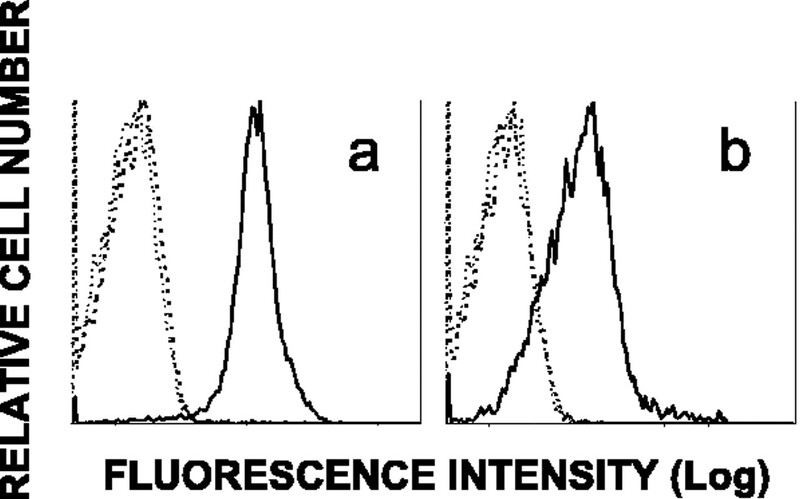 EG7 (thick solid lines, a) and EL4 (thick dotted lines, a) and BL6-10OVA (thick solid lines, b) and BL6-10 (thick dotted lines, b) tumor cells were stained with the rabbit anti-OVA Ab (Sigma-Aldrich), followed with the FITC-conjugated goat anti-rabbit IgG Ab, and then analyzed by flow cytometry. Tumor cells stained with normal rabbit serum were used as control populations (thin dotted lines). One representative experiment of two is displayed. Activated, mature bone marrow-derived DCs, expressing high levels of MHC class II, CD40, CD54, and CD80, were generated from C57BL/6 mice as described previously (27). To generate OVA-pulsed DCs (DCOVA), DCs were pulsed overnight at 37°C with 0.1 mg/ml OVA (Sigma-Aldrich, then washed extensively (26). Naive OVA-specific CD4+ T and CD8+ T cells were isolated from OT II or OT I mouse spleens, respectively, and enriched by passage through nylon wool columns. CD4+ and CD8+ cells were then purified by negative selection using anti-mouse CD8 (Ly2) or CD4 (L3T4) paramagnetic beads (Dynal Biotech) to yield populations that were >98% CD4+/Vα2Vβ5+ or CD8+/Vα2Vβ5+, respectively. To generate DCOVA-activated CD4+ T cells, CD4+ T cells (2 × 105 cells/ml) from OT II mice or designated gene-deleted OT II mice were stimulated for 3 days with irradiated (4000 rad) bone marrow-derived DCOVA (1 × 105 cells/ml) in the presence of IL-2 (10 U/ml), IL-12 (5 ng/ml), and anti-IL-4 Ab (10 μg/ml) (R&D Systems) (28). 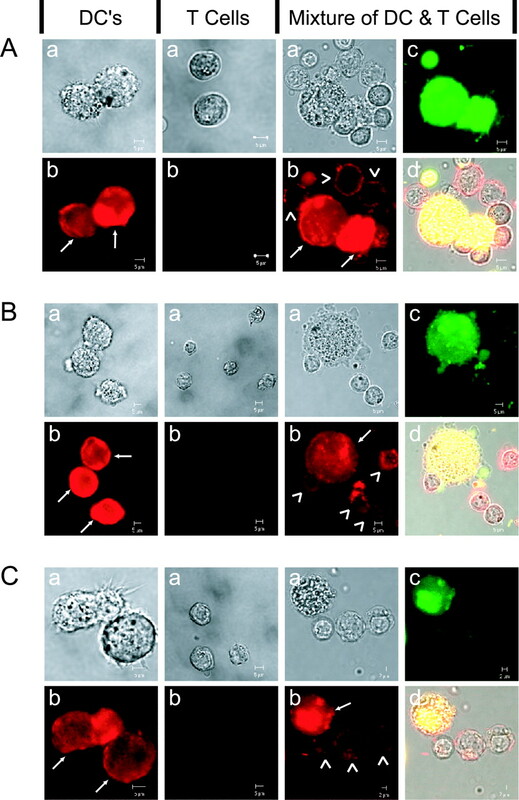 These in vitro DCOVA-activated CD4+ T cells, also referred to herein as CD4+ Th-APCs, were then isolated by Ficoll-Paque (Sigma-Aldrich) density gradient centrifugation or further purified using CD4 microbeads (Miltenyi Biotec) in some experiments. Con A-stimulated OT II CD4+ T (Con A-OT II) cells were similarly generated by incubating splenocytes from OT II or OT II/KO mice with Con A (1 μg/ml) and IL-2 (10 U/ml) for 3 days, after which the CD4+ T cells were purified on density gradients. To ascertain that no DCs were in purified Th-APCs or Con A-OT II cells, these active T cells were further purified by using CD4 microbeads (Miltenyi Biotec). For the phenotypic analyses, Th-APCs were stained with Abs specific for H-2Kb, Iab, CD3, CD4, CD8, CD11b, CD11c, CD25, CD54, CD69, CD80, and Vα2Vβ5+ TCR (BD Pharmingen), respectively, and analyzed by flow cytometry. For the intracellular cytokines, cells were restimulated with 4000 rad-irradiated BL27 tumor cells pulsed with OVAII peptide for 4 h (28), and then processed using a Cytofix/CytoPerm Plus with GolgiPlug kit (BD PharMingen), with R-PE-conjugated anti-IL-4, -perforin, and -IFN-γ Abs (R&D Systems), respectively. Culture supernatants of the restimulated Th-APCs were analyzed for IFN-γ, IL-2, and IL-4 expression using ELISA kits (Endogen) as reported previously (26). In in vitro membrane transfer assay, DCOVA or DCs were incubated with CFSE (0.5 μM) at 37°C for 15 min and washed three times with PBS. CFSE-labeled DCOVA or DCs were incubated with Con A-OT II cells at 37°C for 4 h, then the cell mixtures, the original DCOVA and Con A-OT II cells, were stained with a panel of PE-energy-coupled dye (ECD) Abs specific for H-2Kb, CD54, and CD80, respectively, and analyzed by confocal fluorescence microscopy. CD4+ T cells in the cell mixture were also purified by cell sorting and analyzed by flow cytometry. Con A-OT II cells stained with biotin-labeled isotype-matched Abs and ECD-avidin (BD Pharmingen) were used as controls. In in vivo membrane transfer assay, naive T cells were isolated from OT II/Iab−/− and OT II/CD80−/− mouse spleens, respectively, and enriched by passage through nylon wool columns. The CD4+ T cells (5 × 106 cells/mouse) were further purified by negative selection using the anti-mouse CD8 (Ly2) paramagnetic beads (Dynal Biotech) and then i.v. injected into wild-type C57BL/6 mice. One group of mice remained untreated. One day subsequent to the injection, another group of mice were i.v. immunized with irradiated (4000 rad) DCOVA (0.2 × 106 cells/mouse). Three days after the immunization, mice were sacrificed. T cells were isolated from the spleens of these two groups of mice and enriched by passage through nylon wool columns. The OVA-specific CD4+ OT II T cells were further purified from these T cells by positive selection using the biotin-anti-TCR Ab and anti-biotin microbeads (Miltenyi Biotec), and then stained with FITC-anti- Iab and FITC-anti-CD80 Abs for flow cytometric analysis, respectively. RF3370 hybridoma cells (0.5 × 105 cells/well) were cultured with irradiated (4000 rad) DCOVA or Th-APCs or Con A-OT II (1 × 105 cells/well) for 24 h. To investigate the fate of acquired MHC class I/peptide expression, Th-APCs alone were cultured for 1, 2, and 3 days in culture medium containing IL-2 (10 U/ml), termed Th-APC (1, 2, and 3 days), and then harvested for stimulation of RF3370 cells, respectively. The supernatants were harvested for measurement of IL-2 secretion using an ELISA kit (Endogen). For in vitro CD8+ T cell proliferation assay, irradiated (4000 rad) stimulators, the Th-APCs, Con A-OT II cells (0.4 × 105 cells/well), DCOVA (0.1 × 105 cells/well), and their 2-fold dilutions, were cultured with a constant number of responders, the naive OT I or C57BL/6 (B6) CD8+ T cells (0.5 × 105 cells/well). To rule out the potent effect of endogenous H-2Kb, Th-APCs generated from H-2Kb−/− OT II T cells were termed Kb−/− Th-APCs and used as stimulator. In some experiments, each of a panel of neutralizing reagents (anti-IL-2, -H-2Kb or -LFA-1 Abs, and CTLA-4/Ig fusion protein) (each 15 μg/ml; R&D Systems) or a mixture of the above reagents were added to the cells, while control cells received a mixture of isotype-matched irrelevant Abs and fusion protein. In other experiments, the irradiated CD4+ Th-APCs and naive OT I CD8+ T cells were cultured in Transwell plates (Costar), separated by 0.4-μm pore-sized membranes. After 48 h, thymidine incorporation was determined by liquid scintillation counting (26). For the in vivo CD8+ T cell proliferation assay, purified naive OT I CD8+ T cells were labeled with CFSE (1.5 μM) and i.v. injected into C57BL/6 mice (2 × 106 cells each). Twelve hours later, each mouse was i.v. injected with 2 × 106 Th-APCs and Con A-OT II cells, respectively, or 0.2 × 106 DCOVA. In another group, mice were injected with PBS. Three days later, the splenic T cells from the recipients were stained with ECD-anti-CD8 Ab (Beckman Coulter) and then analyzed by flow cytometry. For the in vitro cytotoxicity assay, the activated CD8+ T cells derived from the above 3-day coculture with irradiated (4000 rad) DCOVA, Th-APCs, and Con A-OT II cells were purified on density gradients and termed DCOVA/OT I, Th-APC/OT I, and Con A-OT II/OT I, respectively. These cells as well as Th-APCs were used as effector cells, while 51Cr-labeled EG7, the control EL4 tumor cells, DCOVA, LB27, and OVAII-pulsed LB27 (LB27OVAII) tumor cells were used as target cells, respectively. Specific killing was calculated as: 100 × [(experimental cpm − spontaneous cpm)/(maximal cpm − spontaneous cpm)] as previously described (26). We adapted a recently reported in vivo cytotoxicity assay (29). Briefly, C57BL/6 mice were i.v. immunized with DCOVA (0.5 × 106 cells), Th-APCs or Con A-OT II cells (2 × 106 cells). Seven days later, mice were boosted once. In another group, mice were injected with PBS. Naive mouse splenocytes were incubated with either high (3.0 μM, CFSEhigh) or low (0.6 μM, CFSElow) concentrations of CFSE to generate differentially labeled target cells. The CFSEhigh cells were pulsed with OVAI, whereas the CFSElow cells were pulsed with the irrelevant 3LL lung carcinoma H-2Kb peptide Mut1 and served as internal controls. These peptide-pulsed target cells were washed extensively to remove free peptide and then i.v. coinjected at 1:1 ratio into the above described immunized mice 3 days after the boost. Sixteen hours after target cell delivery, the spleens were removed and residual CFSEhigh and CFSElow target cells remaining in the recipients’ spleens were sorted and analyzed by flow cytometry. Wild-type C57BL/6 mice (n = 8) were injected i.v. with 0.2 × 106 DCOVA, 2 × 106 Th-APCs, and Con A-OT II cells, respectively, and then 7 days later they were boosted once. To study the immune mechanism, CD4 and CD8 KO mice (n = 8) were injected i.v. with 2 × 106 Th-APCs and then 7 days later the mice were boosted once. Three days subsequent to the boost, the mice were i.v. given 0.5 × 106 BL6-10OVA or BL6-10 tumor cells. The mice were sacrificed 4 wk after tumor cell injection and the lung metastatic tumor colonies were counted in a blind fashion (22). Metastases on freshly isolated lungs appeared as discrete black-pigmented foci that were easily distinguishable from normal lung tissues and confirmed by histological examination. Metastatic foci too numerous to count were assigned an arbitrary value of >100. To explore DC membrane-derived APC machinery acquisition by CD4+ T cells, Con A-stimulated CD4+ T cells from OVA-specific TCR-transgenic OT II mice were cultured for 4 h. either alone or with DCOVA or DC. The CD4+ T cells were then sorted and examined for expression of MHC class I and II, CD54, and CD80 by flow cytometry. The control Con A-stimulated OT II CD4+ T cells expressed some MHC class I and II, CD54, and CD80. However, following incubation with DCOVA, these T cells displayed moderately augmented levels of these molecules (Fig. 3⇓A), suggesting that DC molecules could have been transferred to the T cells. The membrane transfer can be mostly blocked by addition of anti-H-2Kb and LFA-1 Abs and CTLA-4/Ig fusion protein (data not shown), indicating that the membrane acquisition of Th-APCs from DCOVA is mediated by TCR and costimulatory molecules. In addition, these T cells following interaction with DCs without OVA pulsing also displayed augmented levels of these molecules, but to a lesser extent (data not shown), indicating that these DC molecule transfer is mediated by both the Ag-specific and nonspecific manners. Transfer of DC membrane molecules to active CD4+ T cells. A, CFSE-labeled DCOVA were incubated with Con A-stimulated CD4+ T cells from OT II mice. 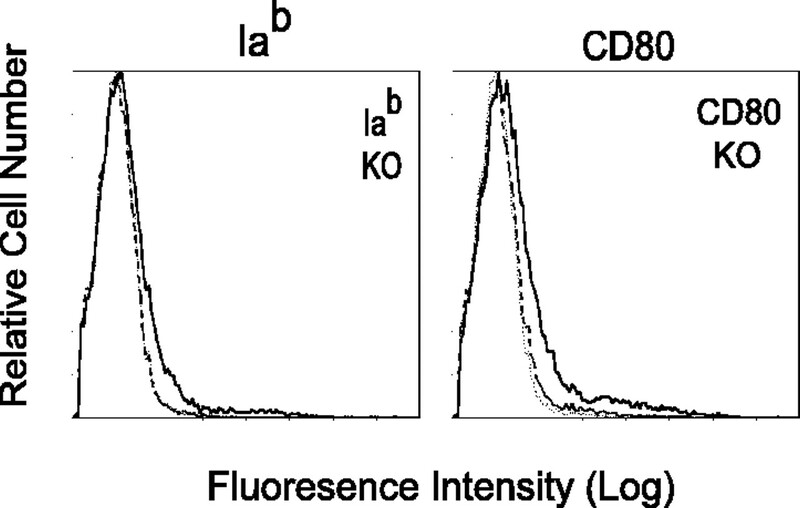 T cells with (thick solid lines) and without (thick dotted lines) incubation of DCOVA were stained with Abs and analyzed for expression of H-2Kb, Iab, CD54, and CD80 by flow cytometry, respectively. B, CFSE-labeled DCOVA were incubated with Con A-stimulated CD4+ T cells from H-2Kb, Iab, CD54, and CD80 gene KO OT II mice, respectively. T cells with (thick solid lines) and without (thick dotted lines) incubation of DCOVA were stained with Abs and analyzed for expression of the above molecules, respectively. T cells with incubation of DCOVA were also stained with isotype-matched Abs and used as control populations (thin dotted lines). C, DCOVA-activated CD4+ T cells (Th-APCs) from OT II mice were stained with a panel of Abs (thick solid lines) and analyzed by flow cytometry. The control CD4+ T cells (thin dotted lines) were only stained with isotype-matched Abs. D, DCOVA-activated CD4+ T cells (Th-APCs) from H-2Kb, Iab, CD54, and CD80 gene KO OT II mice, respectively, were stained with a panel of Abs (thick solid lines). The control CD4+ T cells (thin dotted lines) were only stained with isotype-matched Abs. One representative experiment of two in the different experiments above is shown. Since all T cells express MHC class I and CD54 and some activated T cells also express MHC class II and CD80 molecules (30, 31), it was necessary to confirm that the increased levels of T cell-associated MHC class I and II, CD54, and CD80 were not due to endogenous T cell up-regulation of these molecules. Thus, we incubated CFSE-labeled DCOVA with Con A-stimulated CD4+ T cells derived from OT II mice with homozygous H-2Kb, Iab, CD54, and CD80 gene KO, respectively, then sorted the T cells and assessed their expression of these markers. The T cells did not express their respectively deleted gene products when cultured alone, but did discernibly express H-2Kb, Iab, CD54, and CD80 after a 4-h incubation with DCOVA, as determined by flow cytometry (Fig. 3⇑B) or confocal fluorescence microscopy (Fig. 4⇓). These results indicate that, besides previously reported MHC class I transferred onto CD8+ T cells during DC-CD8+ T cell interaction and MHC class II and CD80 molecules transferred onto CD4+ T cells during DC-CD4+ T cell interaction (21, 32, 33), CD4+ T cells can also acquire CD54 forming the immune synapse (18, 19) as well as the bystander MHC class I molecules from DCs after DC stimulation of CD4+ T cells. In addition to the mechanism of Ag-specific MHC-TCR-mediated internalization and recycling (20, 21), the uprooting of APC molecules or APC-released vesicles may also contribute to the above described membrane transfer, especially the bystander MHC class I (34). Membrane acquisition analysis by confocal fluorescence microscopy. CFSE-labeled DCOVA were incubated with Con A-stimulated CD4+ T cells from H-2Kb (A), CD54 (B), and CD80 gene KO OT II (C) mice, stained with fluorochrome-labeled Abs, and analyzed by confocal fluorescence microscopy. Images include DCs (larger cells) alone, T (smaller) cells alone, or a mixture of DCs and T cells (a) under differential interference contrast, with a cell surface stain consisting of ECD (red) Ab for either H-2Kb, CD54, or CD80 (b), with cytoplasmic CFSE stain (green, c), and with both stains (d). Our data confirm that 1) DCOVA (larger cells), but not gene-deleted T cells (smaller cells), express H-2Kb, CD54, and CD80 molecules (arrows) and 2) during coculture of DCOVA with T cells, the T cells acquire H-2Kb, CD54, and CD80 molecules (arrowheads). One representative experiment of two is shown. We then examined whether naive T cells can also acquire DC Ag-presenting machinery in culture. Naive OT II CD4+ T cells were first purified by using a nylon column to remove DCs and B cells and anti-CD8 paramagnetic beads (Dynal Biotech) to remove CD8+ T cells and then incubated for 3 days with irradiated DCOVA. The activated OT II CD4+ T cells were then purified by using Ficoll-Paque density gradient centrifugation and CD4 microbeads (Miltenyi Biotec) and then analyzed by flow cytometry. These T cells, which proliferated in response to DCOVA stimulation, expressed cell surface CD4, CD25, and CD69 and intracellular perforin and IFN-γ, but not IL-4 (Fig. 3⇑C); they also secreted IFN-γ (∼2 ng/ml per 106 cells/24 h) and IL-2 (∼2.5 ng/ml per 106 cells/24 h), but not IL-4, in culture. These data indicate that these OVA-TCR-transgenic CD4+ T cells were Th1. In addition, there was no CD11b+/11c+ DC population existing in these purified CD4+ T cells (Fig. 3⇑C). This is because that any survival of irradiated DCOVA cells and the potential small amount of contamination of spleen DCs or B cells within the original naive OT II CD4+ T cell preparation, which might have picked up OVA peptides from irradiated DCOVA in the culture, would be eliminated by the killing activity of these activated Th1 cells expressing perforin (see Fig. 7⇓B) (35, 36). In addition to the common H-Kb expression, these Th cells also expressed Iab, CD54, and CD80 molecules and here too they did so whether they were derived from wild-type or homozygous H-2Kb−/−, Iab−/−, CD54−/−, or CD80−/− KO mice (Fig. 3⇑D). Thus, we clearly demonstrate that naive CD4+ T cells can also acquire MHC class II and costimulatory molecules (CD54 and CD80) composing the immune synapse as well as the bystander MHC class I from DCs by in vitro DC stimulation. To further confirm the membrane acquisition in vivo, wild-type C57BL/6 mice were first injected with purified CD4+ OT II/Iab−/− and OT II/CD80−/− T cells and then immunized with DCOVA. Three days after the immunization, mice were sacrificed. CD4+ OT II T cells were purified from these immunized mouse spleens and then stained with FITC-anti-Iab and FITC-anti-CD80 Abs for flow cytometric analysis, respectively. As shown in Fig. 5⇓, CD4+ OT II/Iab−/− and OT II/CD80−/− T cells derived from mice immunized with DCOVA became slightly Iab and CD80 positive, respectively, whereas these T cells derived from mice without immunization remained Iab and CD80 negative, indicating that CD4+ OT II T cells acquire Iab and CD80 molecules by in vivo DCOVA stimulation. In in vivo membrane transfer assay. The CD4+ T cells purified from OT II/Iab−/− and OT II/CD80−/− mice were transferred into wild-type C57BL/6 mice, respectively. The first group of mice was untreated and the second group of mice was immunized with DCOVA. The CD4+ OT II/Iab−/− and OT II/CD80−/− T cells were then purified from the first (thick dotted lines) and the second group (solid lines) of mice and then stained with the FITC-anti-Iab and FITC-anti-CD80 Abs and the FITC-conjugated isotype-matched Abs (thin dotted lines) for flow cytometric analysis, respectively. One representative experiment of three is shown. If the CD4+ T cell-acquired H-2Kb were in the form of OVAI peptide complexes and the DC costimulatory molecules were functional, then these IL-2-secreting T cells could potentially act as direct APCs (termed CD4+ Th-APCs) for CD8+ T cell stimulation. To examine the functionality of these putative Th-APC cells, we initially assessed their ability to stimulate IL-2 secretion of T cell hybridoma RF3370. As shown in Fig. 6⇓A, RF3370 cells alone did not secret IL-2. However, Th-APCs significantly stimulated RF3370 to secret IL-2 (95 pg/ml) as did DCOVA (220 pg/ml), indicating that Th-APCs expressed functional H-2Kb-OVAI peptide complexes. If the acquired MHC I-OVAI peptide complexes are of any functional significance in vivo, they would need to be stably expressed. The rate of their decay was assessed by culturing these Th-APCs after MHC class I acquisition for varying time periods. As shown in Fig. 6⇓A, the ability to stimulate IL-2 secretion of RF3370 cells did decay over time. However, readily detectable MHC class I/peptide expression was still observed as much as 3 days after in vitro culture. CD4+ T-APCs stimulate RF3370 and OT I CD8+ T cells. A, MHC class I presentation of OVA to RF3370 hybridoma by Th-APCs. The amount of IL-2 secretions of stimulated RF3370 cells in examining wells was subtracted by the amounts of IL-2 in wells containing DCOVA, Th-APC, and Con A-OT II alone, respectively. ∗, p < 0.01 (Student’s t test) vs cohorts of Con A-OT II. B, In vitro CD8+ T cell proliferation assay. Varying numbers of irradiated Th-APCs, Kb−/− Th-APCs, Con A-OT II, and DCOVA cells were cocultured with naive OT I or B6 CD8+ T cells. After 3 days, the proliferative responses of the CD8+ T cells were determined by [3H]thymidine uptake assays. C, Th-APCs were cultured with OT I CD8+ T cells either separated in Transwells or not (all other bars). In the latter cultures, the impact on OT I CD8+ T cell proliferation of adding each of the neutralizing reagents, all neutralizing reagents together (mixed reagents), or all control Abs and fusion proteins (control reagents) was assessed. In one set of wells, supernatants from cultured Th-APCs (supernatants) were added to the CD8+ T cells in place of the Th-APCs themselves. ∗, p < 0.01 (Student’s t test) vs cohorts of Th-APC. D, In vivo CD8+ T cell proliferation assay. CFSE-labeled OT I CD8+ T cells were i.v. injected into C57BL/6 mice. Twelve hours later, each mouse was i.v. given Th-APCs or Con A-OT II cells or DCOVA or PBS, then 3 days later the numbers of division cycles of the CFSE-labeled CD8+ T cells in the recipient spleens were determined by flow cytometry. One representative experiment of three in the above experiments is shown. To further confirm it, we then assessed their ability to induce proliferation of naive OT I CD8+ T cells in vitro. The positive control DCOVA cells that were previously demonstrated to possess a highly activated phenotype (27) strongly induced OT I cell proliferation (Fig. 6⇑B). DCOVA-activated CD4+ Th-APCs, which were purified by Ficoll-Paque density gradient centrifugation and using CD4 microbeads, did indeed stimulate proliferation of OT I CD8+ T cells, but to a lesser extent due to 1) fewer costimulatory molecules and 2) lacking the third signal, DC-secreted IL-12 (37), compared with DCOVA. However, they did not stimulate responses of the control naive C57BL/6 (B6) mouse CD8+ T cells, nor did Con A-stimulated OT II CD4+ T (Con A-OT II) cells (secreting IFN-γ (∼4.0 ng/ml per 106 cells/24 h) and IL-2 (∼3.3 ng/ml per 106 cells/24 h), but lacking self-IL-4 and acquired H-2Kb-OVA peptide complexes) stimulate OT I CD8+ T cell proliferation. In addition, Kb−/− Th-APCs derived from the H-2Kb−/− OT II KO mice (Fig. 3⇑D) showed similar CD8+ T cell stimulatory activity as Th-APCs derived from the wild-type OT II mice (Fig. 6⇑B), indicating that the activation of CD8+ OT I T cells is mediated via the acquired H-2Kb-OVA peptide complexes, but not the endogenous H-2Kb of Th-APCs. In separate experiments, we demonstrated that CD8+ T cell stimulatory activity of the Th-APCs was contact dependent since Transwells blocked CD8+ T cell proliferation (Fig. 6⇑C). Furthermore, adding anti-MHC class I or anti-LFA-1 Abs or CTLA-4/Ig fusion protein could significantly inhibit the OT I CD8+ T cell proliferative response in the cocultures by 38, 50, and 58%, respectively, whereas anti-IL-2 Ab had less effect (19% inhibition; p < 0.01). Simultaneous addition of all blocking reagents reduced the proliferative response by 92% (p < 0.01). Taken together, these data indicate that this response is critically dependent on H-2Kb/OVAI/TCR specificity and is greatly affected by nonspecific costimulatory CD54-LFA-1 and CD80-CD28 interactions between the CD4+ Th-APCs and CD8+ T cells. 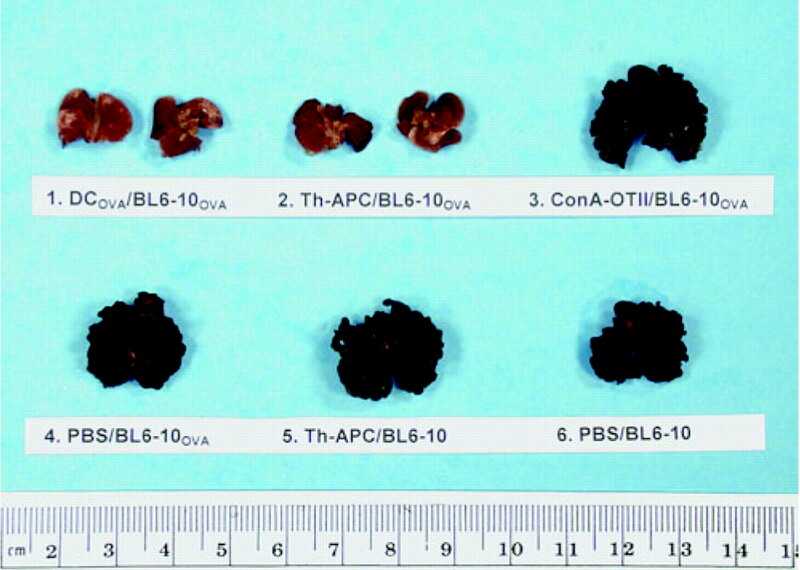 That this proliferative effect was not simply an in vitro artifact was confirmed by demonstrating that these Th1-APCs can also stimulate proliferative responses in vivo. We adoptively transferred CFSE-labeled naive OT I CD8+ T cells into mice that were also given Th-APCs, Con A-OT II cells, DCOVA, or PBS. The labeled CD8+ T cells did not show any division in mice treated with PBS (data not shown). However, the labeled CD8+ T cells underwent some cycles of cell division in the mice given either Th-APCs or DCOVA, but did not respond in the animals given Con A-OT II cells (Fig. 6⇑D). As a critical test of the functionality of these purified CD4+ Th-APCs, we tested their ability to induce the differentiation of naive OT I CD8+ T cells into CTL effectors, as determined using in vitro 51Cr release assays with EG7 tumor cells expressing an OVA transgene. 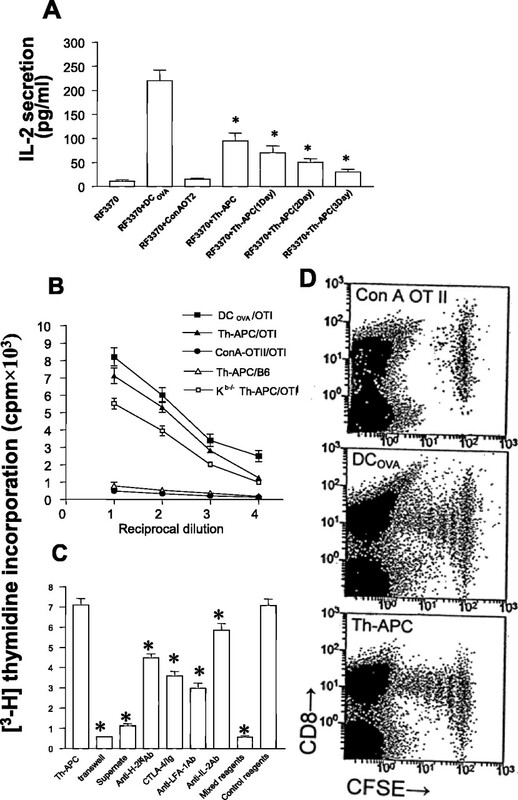 The Th-APC-activated OT I CD8+ T (Th-APC/OT I) cells displayed substantial cytotoxic activity (33% specific killing; E:T ratio, 12) against an OVA-expressing EG7 cell line as did the DCOVA-activated OT I CD8+ T (DCOVA/OT I) cells (46% killing; E:T ratio, 12), but not against its parental EL4 tumor cells (Fig. 7⇓A), indicating that the killing activity of these CTLs is OVA tumor specific. In addition, these CD4+ Th-APCs expressing perforin (Fig. 3⇑C) displayed killing activities for DCOVA and LB27OVAII cells with Iab/OVAII expression (Fig. 7⇓B). However, they themselves did not show any killing activity to LB27 and EG7 (Fig. 7⇓B) or BL6-10OVA cells (data not shown) without Iab/OVAII expression. As with the proliferation assays, the in vitro CD8+ CTL induction capacity of CD4+ Th-APCs can also be translated into an induction of effector CTL function in vivo. We adoptively transferred OVAI peptide-pulsed splenocytes that had been strongly labeled with CFSE (CFSEhigh), as well as the control peptide Mut1-pulsed splenocytes that had been weakly labeled with CFSE (CFSElow), into recipient mice that had been vaccinated with these purified Th-APCs, DCOVA, Con A-OT II cells, or PBS. We assessed the disappearance of the labeled cells from the mice by flow cytometric analysis and found that the CFSElow (irrelevant Mut1 peptide-pulsed) cells were unaffected by the vaccination protocol. In addition, we found that no substantial loss (1%) of the CFSEhigh (OVAI peptide-pulsed) cells from the PBS-immunized mice (data not shown). However, there was substantial loss of the CFSEhigh (OVAI peptide-pulsed) cells from the Th-APC-immunized (86%) or DCOVA-vaccinated (97%) mice, but not from the Con A-OT II cell-vaccinated (2%) mice (Fig. 7⇓C). These data indicate that CD4+ Th-APCs carrying H-2Kb-OVAI complexes and DC costimulatory molecules can stimulate the development of OVA-specific CTL effector cells in vivo. CD4+ T-APC induce the development of Ag-specific CTL activity in vitro and in vivo. In vitro cytotoxicity assay. A, Three types of activated CD8+ T cells (DCOVA/OT I, Th-APC/OT I, and Con A-OT II/OT I) were used as effector (E) cells, whereas 51Cr-labeled EG7 or control EL4 tumor cells used as target (T) cells. B, Th-APCs were used as effector cells, whereas 51Cr-labeled EG7, DCs, DCOVA, LB27, and EG7OVAII cells used as target cells. The data are presented as the percent specific target cell lysis in 51Cr release assay. Each point represents the mean of triplicate cultures. C, In vivo cytotoxicity assay. C57BL/6 splenocytes differentially labeled to CFSEhigh and CFSElow were pulsed with OVAI and Mut1 peptide, respectively. These splenocytes were then i.v. injected at a ratio of 1:1 into mice immunized with DCOVA, Th-APCs, or Con A-OT II cells or PBS. Sixteen hours later, the CFSEhigh or CFSElow cells remaining in the spleens were determined by flow cytometry. The value in each panel represents the percentage of CFSEhigh cells vs CFSElow cells remaining in the spleens. In addition, Th-APCs can also stimulate OVA-specific CTL-mediated antitumor immunity in vivo. We injected these purified Th-APCs i.v. into mice, followed by i.v. challenge with OVA-expressing BL6-10OVA or OVA-negative BL6-10 tumor cells. All mice immunized with Con A-OT II cells (i.e., cells lacking acquired H-2Kb-OVAI complexes and costimulatory molecules) as well as the control mice (eight of eight) without any immunization had large numbers (>100) of lung metastatic tumor colonies 4 wk after tumor cell challenge (Expt. 1 in Table I⇓ and Fig. 8⇓). In addition, all mice (eight of eight) immunized with naive OT II T cells also died of lung metastasis (data not shown). However, all mice (eight of eight) immunized with Th-APCs had no lung tumor metastasis. DCOVA immunization was equally effective in inducing antitumor immunity. The specificity of the protection was confirmed with the observation that Th-APCs did not protect against BL6-10 tumors that did not express OVA, with all mice having large numbers (>100) of lung metastatic tumor colonies after tumor cell challenge. To study the immune mechanism, CD4 and CD8 KO mice were used for immunization of Th-APCs. As shown in experiment 2 in Table I⇓, all of the CD4 KO mice (eight of eight) were still protected from BL6-10OVA tumor challenge, indicating that activation of CD8+ CTL response by Th-APCs is independent on the host CD4+ T cells. However, all CD8 KO mice (eight of eight) had numerous lung tumor metastases, indicating that the Th-APCs-driven antitumor immunity is mediated by CD8+ CTLs. 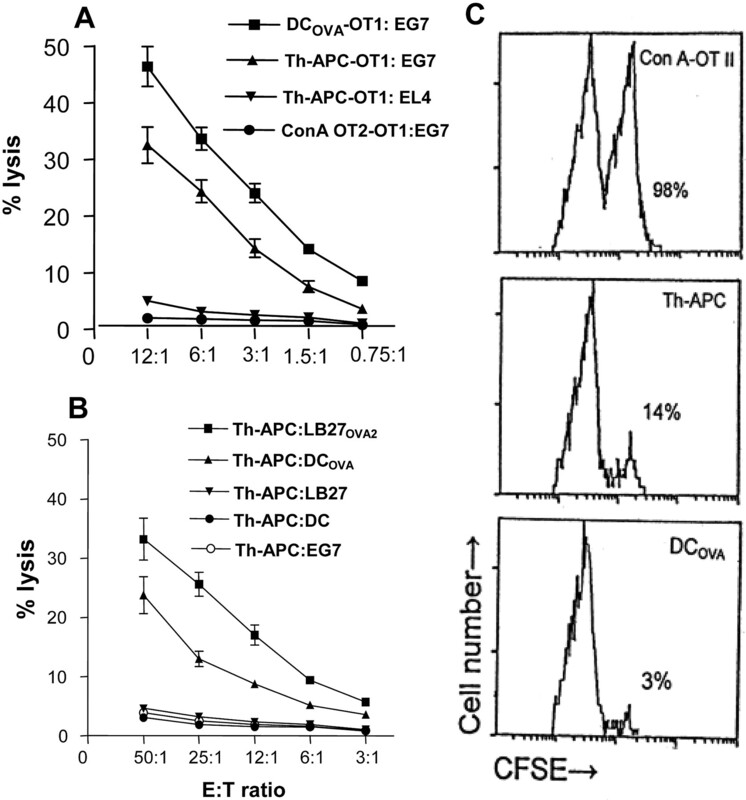 The Th-APC-induced CD8+ CTL response is more likely through direct interaction between Th-APCs and CD8+ CTLs rather than cross-presentation of the host DCs picking up OVA peptides released from Th-APCs, because the former is CD4+ T cell independent, whereas the latter is CD4+ T cell dependent. Immune protection of lung metastasis in mice immunized with Th-APCs. Pulmonary metastases were formed in different groups of immunized mice by i.v. injection of 0.5 × 106 BL6-10OVA or BL6-10 tumor cells. Four weeks later, mouse lungs were removed. The extent of lung metastasis in six different groups of mice described in experiment 1 in Table I⇓ is displayed. A long-standing paradox in cellular immunology has been the conditional requirement for CD4+ Th cells in priming of CD8+ CTL responses. CTL responses to noninflammatory stimuli (e.g., MHC class I alloantigen Qa-1, the male HY Ag) are CD4+ T cell dependent (2, 38, 39). Our data clearly demonstrate the critical helper requirement for CTL induction, as have two other recent reports. Wang and Livingstone (40) showed that the primary CD8+ T cell responses to Ags presented in vivo by peptide-pulsed DCs are also dependent on help from CD4+ T cells. More important, Behrens et al. (41) have demonstrated that coinjection of Ag-presenting DC-activated, but not naive, CD4+ OT II T cells induces CTL responses against islet β cell OVA Ag and leads to diabetes in rat insulin promoter OVAhigh transgenic mice. They also found that activated CD4+ OT II T cells provide CD40-mediated help to CD8+ T cell responses without these T cells necessarily seeing Ag on the same APC (41). In contrast, some have suggested that CD4+ T cell help is only essential for memory CTL responses (29). Thus, the generation of effectors from naive CD8+ T cells is reported to be helper independent in mice immunized with irradiated embryonic cells expressing an adenovirus type 5 E1A transgene (42). Having said that, it is highly relevant that such adenoviral challenge would also introduce potent inflammatory signals into the sensitizing microenvironment (leading to high level DC maturation) (43), to say nothing of the potential for help from NK cells (44). In addition, the E1A adenoviral Ag features multiple CD8+ T cells epitopes (45) and therefore also a greater base of Ag-specific CD8+ T cell precursors from which to draw (46). A strong and direct activation of DCs (47) would explain the previous demonstrations that induction of some antiviral CTL responses is CD4+ Th cell independent. T cell-to-T cell (T-T) Ag presentation, dependent upon activated CD4+ T cells first acquiring MHC class II and CD80 molecules from APCs and then stimulating other CD4+ T cells, is increasingly attracting attention (32, 33). However, the roles such T-APCs may play in vivo have been as yet ill-defined and the results of the relevant in vitro studies disparate, in part because multiple experimental systems have been used. For example, CD4+ T-APCs can induce IL-2 production and proliferative responses among naive responder T cells (48, 49), which is consistent with our results in this study. However, these T-APCs have also been shown to induce apoptosis in activated CD4+ T cells or anergization of CD4+ T cell lines (33, 50, 51, 52). In this study, we found that in vivo transfer of CD4+ Th1-APCs expressing high levels of IFN-γ and IL-2, which were generated by incubation of OT II CD4+ T cells with DCOVA in the presence of IL-12 and anti-IL-4 Ab, were able to stimulate OVA-specific CTL responses. Interesting, we also found that in vivo transfer of CD4+ Th2-APCs expressing high levels of IL-4 and IL-10, which were generated by incubation of OT II CD4+ T cells with DCOVA in the presence of IL-4 and anti-IFN-γ Ab, were able to induce OVA-specific immune suppression (data not shown). In other reports, however, in vivo transfer of CD4+ Th1-APCs derived from IL-2-dependent transformed T cell lines has been reported to induce immunosuppressive, but not immunostimulatory effects in the context of autoimmune responses (52, 53). In these studies, the T-APCs used were derived from rather uncharacterized Con A-stimulated allogeneic or Ag-pulsed CD4+ T cell lines. Therefore, it is difficult to assess the extent to which they are representative of T-APCs as they would be generated in vivo. In addition, these studies have addressed only the activation of CD4+ T cell responses. In this study, we have shown that CD4+ T cells can acquire synapse-composed MHC class II, CD54, and CD80 molecules from APCs by APC stimulation. In addition, for the first time, we have shown that CD4+ T cells can also acquire the bystander MHC class I-OVAI peptide complexes which are critical molecules in stimulation of OVA-specific CTL responses. Furthermore, we have provided a complete line of evidence that compellingly substantiates the practical aspects of CD4+ T cells acting as APCs for effective CD8+ T cell responses in vitro and in vivo. A model of CD4+ T cell help for CTL induction that takes these observations into account would address multiple important aspects of this paradigm in cellular immunology. A central caveat in models of CD4+ T cell help for CTL responses is that of scarcity, or how rare Ag peptide-carrying DCs, Ag-specific CD4+, and Ag-specific CD8+ T cells manage to encounter each other with enough efficiency to ensure that we expeditiously and appropriately respond to all Ags/pathogens (i.e., to maintain the integrity of the organism). It is counterintuitive that a function as critical as this not be optimized in some way. The model wherein APCs that are themselves licensed by Th cells to directly activate CD8+ T cells (Fig. 1⇑B) (5) offers the advantage that a single licensed APC can contact multiple CD8+ T cells and thereby expand the activation signal. However, a very limited number of DCs arriving in lymph nodes would interact with many CD4+ T cells, and our evidence demonstrates that they both induce marked proliferative responses among the naive Ag-specific CD4+ T cell population and also bestow on them of these progeny Th-APC functionality. In turn, each new Th-APC can interact with and activate naive CD8+ CTL precursor cells, such that they also undergo expansion. The gain in this system is thereby dramatically increased even before the newly activated CTL precursors begin to proliferate. Other aspects of this new model also fit in well with the practical and theoretical constraints of Th-cell-dependent CTL responses in the host. Experimental evidence clearly shows that provision of IL-2 dramatically augments the efficiency of precursor CTL expansion (2, 3, 4). We have shown that Th-APCs produce IL-2, and our data explain quite simply how CD4+ Th cells’ IL-2 would be efficiently and precisely targeted to Ag-specific CD8+ T cells. It also addresses the requirement for cognate CD4+ T cell help for CD8+ CTL precursors (3, 4, 54), with the APCs in this case being by definition a cognate Th cell. Taken together, this study clearly delineates the role CD4+ Th-APCs can play in stimulation of CD8+ CTL responses. It also provides a solid experimental foundation for each of the tenants of a new dynamic model of sequential two-cell interactions by CD4+ Th-APCs in Th-cell-dependent CTL immune responses. Not only are Th-APC effective inducers of Ag-specific CTL activity in vitro, but also they efficiently induce protective antitumor immunity in vivo, thereby confirming their physiological relevance. Although we have addressed multiple parameters of this new model in the context of Th cell-dependent CTL responses, in principle its conditions could be equally well met in regulatory T cell-dependent tolerance induction. From our perspective, we are most interested in its impact on the study of antitumor immunity, cancer vaccine development, and other immune disorders (e.g. autoimmunity). We thank J. Gordon for useful comments in preparation of this manuscript and Y. Wei and M. Boyd for help in confocal fluorescence microscopy and flow cytometry, respectively. ↵1 This work was supported by Research Grants MOP63259 and 67230 from the Canadian Institute of Health Research (to J.X.). Y.L. was supported by Postdoctoral Fellowship Award from the Canadian Institute of Health Research. ↵3 Abbreviations used in this paper: CD40L, CD40 ligand; KO, knockout; DC, dendritic cell; DCOVA, OVA-pulsed DC; LB27OVAII, OVAII peptide-pulsed LB27 cells; ECD, energy-coupled dye. Pardoll, D.. 1998. Cancer vaccines. Nat. Med. 4:(Suppl. 5): 525-531. Keene, J. A., J. Forman. 1982. Helper activity is required for the in vivo generation of cytotoxic T lymphocytes. J. Exp. Med. 155: 768-782. Mitchison, N. A., C. O’Malley. 1987. Three-cell-type clusters of T cells with antigen-presenting cells best explain the epitope linkage and noncognate requirements of the in vivo cytolytic response. Eur. J. Immunol. 17: 1579-1583. Bennett, S. R., F. R. Carbone, F. Karamalis, J. F. Miller, W. R. Heath. 1997. Induction of a CD8+ cytotoxic T lymphocyte response by cross-priming requires cognate CD4+ T cell help. J. Exp. Med. 186: 65-70. Bousso, P., E. Robey. 2003. Dynamics of CD8+ T cell priming by dendritic cells in intact lymph nodes. Nat. Immunol. 4: 579-585. Bretscher, P. A.. 1999. A two-step, two-signal model for the primary activation of precursor helper T cells. Proc. Natl. Acad. Sci. USA 96: 185-190. Ingulli, E., A. Mondino, A. Khoruts, M. K. Jenkins. 1997. In vivo detection of dendritic cell antigen presentation to CD4+ T cells. J. Exp. Med. 185: 2133-2141. Ruedl, C., P. Koebel, M. Bachmann, M. Hess, K. Karjalainen. 2000. Anatomical origin of dendritic cells determines their life span in peripheral lymph nodes. J. Immunol. 165: 4910-4916. Norbury, C. C., D. Malide, J. S. Gibbs, J. R. Bennink, J. W. Yewdell. 2002. Visualizing priming of virus-specific CD8+ T cells by infected dendritic cells in vivo. Nat. Immunol. 3: 265-271. Tite, J. P.. 1990. Evidence of a role for TNF-α in cytolysis by CD4+, class II MHC-restricted cytotoxic T cells. Immunology 71: 208-212. Rathmell, J. C., M. P. Cooke, W. Y. Ho, J. Grein, S. E. Townsend, M. M. Davis, C. C. Goodnow. 1995. 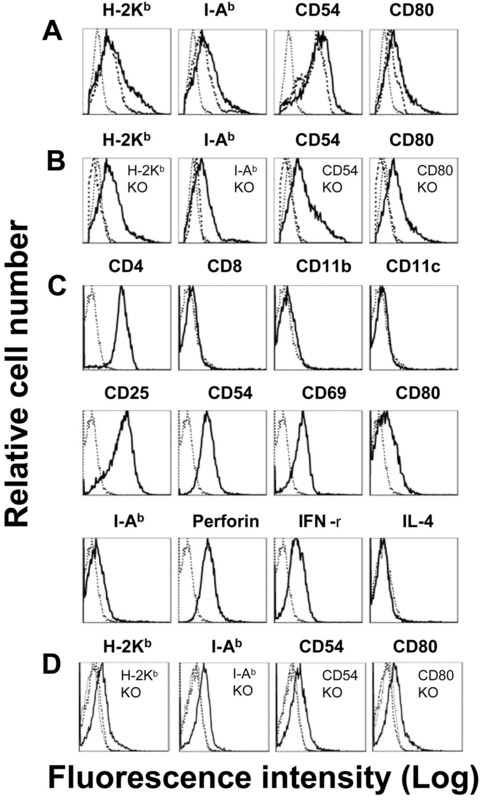 CD95 (Fas)-dependent elimination of self-reactive B cells upon interaction with CD4+ T cells. Nature 376: 181-184. Lenschow, D. J., T. L. Walunas, J. A. Bluestone. 1996. CD28/B7 system of T cell costimulation. Annu. Rev. Immunol. 14: 233-258. Viola, A., S. Schroeder, Y. Sakakibara, A. Lanzavecchia. 1999. T lymphocyte costimulation mediated by reorganization of membrane microdomains. Science 283: 680-682. Hwang, I., J. F. Huang, H. Kishimoto, A. Brunmark, P. A. Peterson, M. R. Jackson, C. D. Surh, Z. Cai, J. Sprent. 2000. T cells can use either T cell receptor or CD28 receptors to absorb and internalize cell surface molecules derived from antigen-presenting cells. J. Exp. Med. 191: 1137-1148. Huang, J. F., Y. Yang, H. Sepulveda, W. Shi, I. Hwang, P. A. Peterson, M. R. Jackson, J. Sprent, Z. Cai. 1999. TCR-mediated internalization of peptide-MHC complexes acquired by T cells. Science 286: 952-954. Kimura, A. K., J. H. Xiang. 1986. High levels of Met-72 antigen expression: correlation with metastatic activity of B16 melanoma tumor cell variants. J. Natl. Cancer Inst. 76: 1247-1254. Mitchell, D., S. Nair, E. Gilboa. 1998. Dendritic cell/macrophage precursors capture exogenous antigen for MHC class I presentation by dendritic cells. Eur. J. Immunol. 28: 1923-1933. Li, M., G. M. Davey, R. M. Sutherland, K. Christian, A. M. Lew, C. Hirst, F. R. Carbone, R. H. William. 2001. Cell-associated ovalbumin is cross-presented much more efficiently than soluble ovalbumin in vivo. J. Immunol. 166: 6099-6103. Slingluff, C.. 1996. Tumor antigens and tumor vaccines: peptides as immunogens. Semin. Surg. Oncol. 12: 446-453. Zhang, W., Z. Chen, F. Li, H. Kamencic, B. Juurlink, J. R. Gordon, J. Xiang. 2003. Tumour necrosis factor-α (TNF-α) transgene-expressing dendritic cells (DCs) undergo augmented cellular maturation and induce more robust T-cell activation and anti-tumour immunity than DCs generated in recombinant TNF-α. Immunology 108: 177-188. Liu, Y., H. Huang, Z. Chen, L. Zong, J. Xiang. 2003. Dendritic cells engineered to express the Flt3L stimulate type 1 immune response, and induce enhanced cytotoxic T and natural killer cell cytotoxcities and antitumor immunity. J. Gene Med. 5: 668-680. Nishimura, T., K. Iwakabe, M. Sekimot, Y. Ohmi, T. Yahata, M. Nakui, T. Sato, S. Habu, H. Tashiro, M. Sato, A. Ohta. 1999. Distinct role of antigen-specific T helper type 1 (Th1) and Th2 cells in tumor eradication in vivo. J. Exp. Med. 190: 617-627. Bourgeois, C., B. Rocha, C. Tanchot. 2002. A role for CD40 expression on CD8+ T cells in the generation of CD8+ T cell memory. Science 297: 2060-2063. Azuma, M., H. Yssel, J. H. Phillips, H. Spits, L. L. Lanier. 1993. Functional expression of B7/BB1 on activated T lymphocytes. J. Exp. Med. 177: 845-850. Sansom, D. M., N. D. Hall. 1993. B7/BB1, the ligand for CD28, is expressed on repeatedly activated human T cells in vitro. Eur. J. Immunol. 23: 295-298. Tatari-Calderone, Z., R. T. Semnani, T. B. Nutman, J. Schlom, H. Sabzevari. 2002. Acquisition of CD80 by human T cells at early stages of activation: functional involvement of CD80 acquisition in T cell to T cell interaction. J. Immunol. 169: 6162-6169. Tsang, J. Y., J. G. Chai, R. Lechler. 2003. Antigen presentation by mouse CD4+ T cells involving acquired MHC class II:peptide complexes: another mechanism to limit clonal expansion. Blood 101: 2704-2710. Hudrisier, D., P. Bongrand. 2002. Intercellular transfer of antigen-presenting cell determinants onto T cells: molecular mechanisms and biological significance. FASEB J. 16: 477-486. Huang, H., F. Li, J. Gordon, J. Xiang. 2002. Synergistic enhancement of antitumor immunity with adoptively transferred tumor-specific CD4 and CD8 T cells and intratumoral lymphotactin transgene expression. Cancer Res. 62: 2043-2051. Li, Y., N. Wang, H. Li, K. King, R. Bassi, H. Sun, A. Santiago, A. Hooper, P. Bohlen, D. Hicklin. 2002. Active immunization against the vascular endothelial growth factor receptor flk1 inhibits tumor angiogenesis and metastasis. J. Exp. Med. 195: 1575-1584. Curtsinger, J., C. Schmidt, A. Mondino, D. Lins, R. Kedl, M. Jenkins, M. Mescher. 1999. Inflammatory cytokines provide a third signal for activation of naïve CD4+ and CD8+ T cells. J. Immunol. 162: 3256-3262. Rosenberg, A. S., T. Mizuochi, S. O. Sharrow, A. Singer. 1987. Phenotype, specificity, and function of T cell subsets and T cell interactions involved in skin allograft rejection. J. Exp. Med. 165: 1296-1315. Rees, M. A., A.S. Rosenberg, T. I. Munitz, A. Singer. 1990. In vivo induction of antigen- specific transplantation tolerance to Qa1a by exposure to alloantigen in the absence of T-cell help. Proc. Natl. Acad. Sci. USA 87: 2765-2769. Wang, J. C., A. M. Livingstone. 2003. Cutting edge: CD4+ T cell help can be essential for primary CD8+ T cell responses in vivo. J. Immunol. 171: 6339-6343. Behrens, G. M., M. Li, G. M. Davey, J. Allison, R. A. Flavell, F. R. Carbone, W. R Heath. 2004. Helper requirements for generation of effector CTL to islet β cell antigens. J. Immunol. 172: 5420-5426. Lyakh, L. A., G. K. Koski, H. A. Young, S. E. Spence, P. A. Cohen, N. R. Rice. 2002. Adenovirus type 5 vectors induce dendritic cell differentiation in human CD14+ monocytes cultured under serum-free conditions. Blood 99: 600-608. Mailliard, R. B., Y. I. Son, R. Redlinger, P. T. Coates, A. Giermasz, W. J. P. A. Morel Storkus, P. Kalinski. 2003. Dendritic cells mediate NK cell help for Th1 and CTL responses: two-signal requirement for the induction of NK cell helper function. J. Immunol. 171: 2366-2373. Wang, B., C. C. Norbury, R. Greenwood, J. R. Bennink, J. W. Yewdell, J. A. Frelinger. 2001. Multiple paths for activation of naive CD8+ T cells: CD4+-independent help. J. Immunol. 167: 1283-1289. Mintern, J. D., G. M. Davey, G. T. Belz, F. R. Carbone, W. R. Heath. 2002. Cutting edge: precursor frequency affects the helper dependence of cytotoxic T cells. J. Immunol. 168: 977-980. Hou, S., X. Y. Mo, L. Hyland, P. C. Doherty. 1995. Host response to Sendai virus in mice lacking class II major histocompatibility complex glycoproteins. J. Virol. 69: 1429-1434. Mauri, D., T. Wyss-Coray, H. Gallati, W. J. Pichler. 1995. Antigen-presenting T cells induce the development of cytotoxic CD4+ T cells. I. Involvement of the CD80-CD28 adhesion molecules. J. Immunol. 155: 118-127. Taams, L. S., W. van Eden, M. H. Wauben. 1999. Antigen presentation by T cells versus professional antigen-presenting cells (APC): differential consequences for T cell activation and subsequent T cell-APC interactions. Eur. J. Immunol. 29: 1543-1550. Nisini, R., A. Fattorossi, C. Ferlini, R. D’Amelio. 1996. One cause for the apparent inability of human T cell clones to function as professional superantigen-presenting cells is autoactivation. Eur. J. Immunol. 26: 797-803. Satyaraj, E., S. Rath, V. Bal. 1994. Induction of tolerance in freshly isolated alloreactive CD4+ T cells by activated T cell stimulators. Eur. J. Immunol. 24: 2457-2461. Mannie, M. D., S. K. Rendall, P. Y. Arnold, J. P. Nardella, G. A. White. 1996. Anergy- associated T cell antigen presentation: a mechanism of infectious tolerance in experimental autoimmune encephalomyelitis. J. Immunol. 157: 1062-1070. Patel, D. M., P. Y. Arnold, G. A. White, J. P. Nardella, M. D. Mannie. 1999. Class II MHC/peptide complexes are released from APC and are acquired by T cell responders during specific antigen recognition. J. Immunol. 163: 5201-5210. Ossendorp, F., E. Mengede, M. Camps, R. Filius, C. J. Melief. 1998. Specific T helper cell requirement for optimal induction of cytotoxic T lymphocytes against major histocompatibility complex class II negative tumors. J. Exp. Med. 187: 693-702.